Steve Murphy and Javier Pena (who are portrayed by Boyd Holbrook and Pedro Pascal, respectively, on the Netflix series) take THR inside some of the drug cartel saga's biggest plot points. For anyone wondering what the real DEA agents behind Narcos think about their portrayal on the Netflix series, Steve Murphy sums it up. "We don’t binge-watch TV, but we binge-watched season two," Murphy told The Hollywood Reporter about blowing through the second season of the cartel drama with his wife in two days. "That’s how much we enjoyed it." Pena adds to THR, "The intrigue, the suspense — it's really well done. There's stuff in there that's never been told." So the pair blew off forthcoming offers, until they met with those who would become the creators of Narcos. "The only stipulation Javier and I have is: Whoever we do this with cannot in any way glorify Pablo Escobar and the Medellin Cartel," Murphy recalls telling showrunner Eric Newman during a dinner in Washington, D.C. "We just hit it off. Eric has lived up to his word 100 percent." Though Narcos is a dramatization, Newman told THR the series is 50-50 when it comes to fiction and nonfiction, and that they stick to the true chronology of events. "We told them how it actually happened," says Pena. "There’s some artistic licenses, but the timeline is accurate." Here, Murphy and Pena take THR behind some of the biggest moments of the second season and delve further into a story that, despite its infamy, still had details that were only now brought to light. "Let me break it down for you: 4,000 soldiers, a 250-man team of Colombia's elite forces, tens of thousands of rounds fired, seven dogs and four f—ing helicopters. Pablo Escobar was surrounded in the middle of f—in' nowhere. There was no way he was getting out of this one, right?" The second season opens with the above words from narrator Steve Murphy as played by Holbrook. Pablo Escobar is then shown in the wilderness, where a group of Colombian police who are frozen with fear simply let him pass. Thus, the 18-month manhunt for Escobar ensues. "That's pretty accurate," Pena says of the blunder. "When Escobar surrendered, many of the original Search Bloc guys got foreign assignments, which is what everybody aspires to, as a reward. So after Escobar escapes, those guys weren't there." In the beginning of season two, Connie Murphy (played by Joanna Christie) left Steve Murphy behind in Colombia. Fed up with the danger, she took the pair's adopted daughter and abruptly flew back to the United States. "When Connie read that her character was going back to Miami, she got upset," Murphy recalls. "She actually talked to Eric [Newman] about it and said: 'I’ve just got one bone to pick with you, I would have never left my husband there!' Eric took it in good stride. [Laughs.]" Connie's departure, however, worked well for the drama. Steve subsequently fell into a downward spiral when abandoned by his family, overcome with emotion from a simultaneous realization that he might be the only "good guy" left. "The violence that’s depicted is all true: Pablo and his people are some of the most violent people to ever walk this earth," he said about experiencing similar feelings. "So you learn who you trust." As the season progresses, more than one of the "good guys" reveal themselves to be in cahoots with Los Pepes, the death squad led by right-wing vigilantes the Castano brothers. Trujillo (Jorge Monterrosa), it is discovered, has been feeding Los Pepes information to aid in the hunting of Escobar and his men. "There was a lot of corruption," says Murphy. "The corruption was even worse in the military. We worked primarily with the police, and they were the guys that we trusted with our lives. They kept us alive when we were out doing operations." He continues, "One of the majors that we worked with, who we literally put our lives in his hands for an extended period of time, we later found out that he was collaborating with Los Pepes. I think he retired from the Colombian National Police and did some work with the Cali Cartel until they were taken down, and I think he eventually went to prison. To find out that he could have taken us out at any time he wanted to, we kind of attribute it to the grace of God. That’s the only thing that kept us alive." Trujillo, who is based on a person whose name has been changed, is also the Colombian cop who ends up pulling the final trigger on Escobar in the season finale. The first season spanned more than a decade as it detailed the rise of Escobar, but the second focused on the 18 months between his escape from La Catedral prison and his eventual death. By shortening the timeline, Newman was able to focus more on the characters, including his villain. "It’s very dangerous to draw a picture of someone as inhuman," he has said. "If you do that, you deny the human side of these guys, which is what allows them to happen." For Murphy, he says it's important to draw a strong line between the humanization of the character on the series and any takeaways that the real Escobar had good intentions. "We tend to say he was a Robin Hood guy because he took some of his ill-gotten gain and helped the poor, but that’s all fantasy," he says. "Pablo really was a manipulator. Now those people all of a sudden became 100 percent loyal to Pablo, willing to give their lives to protect him and work for him." He also downright rejects the notion that Escobar was truly devoted to his family: "Fortune says he’s worth as much as 30 billion dollars. Even if he’s only worth 5 billion dollars, those numbers are astronomical. This guy got the deal of a lifetime from the government of Colombia. He was allowed to plead guilty to one crime and be absolved of every other crime he committed. He was sentenced to five years in his custom-built prison, which was a resort. There were no stipulations that he had to turn over any of his assets: He could have walked away a free man and never have had to work again. He could have watched his children grow up. But we all know, that’s not what he chose to do. He chose the drug business, he chose his greed and his ego over his family. That's not a dedicated family man." The real leader of the Search Bloc, Hugo Martinez, is still alive today. "Colonels Carrillo and Pinzon are both based on Colonel Hugo Martinez," Newman has explained. "In reality, Martinez and his son catch Escobar, but we liked the idea of killing Carrillo [Maurice Compte]. Carrillo's death, in episode four, is my favorite, I hope it really surprised people." The narrative decision did surprise Murphy, who said the writers did a "wonderful job." "We went from Pinzon, who was basically an obstacle for us, to Martinez. When he got there it was like, 'Wow, He’s here to take care of business.' Just his appearance and demeanor commands respect. For us that was great because here’s a can-do guy and our ambassador at the U.S. embassy was a can-do guy, so all of the pieces just fell into place for us to move forward. I hated to see Maurice’s character get killed, but it was very exciting. The writers just really astound me. They’re well-versed, it was pretty neat working with them." Judy Moncada (Cristina Umana) was a major player in the alliance of enemies who formed to take down Escobar, until her own partners took her out. Betrayed by Don Berna (Mauricio Cujar), the narco is shipped off to the United States and Pena's plan to bring her on as an informant is foiled in the season finale. Pena tells THR the real Moncada was a "major force behind Los Pepes" and that they were told Don Berna was an informant working with the Search Bloc, authorized by the then-Attorney General. "We never signed him up as a DEA informant, but he was at the base and I could always tell there was something weird," he says, adding that after Escobar's death, Don Berna went on to become a trafficker and is now in prison in the United States. "After Escobar is killed, maybe two or three years later, we find out the real truth that one of our officers at the Search Bloc was hand-in-hand with Los Pepes." As for the Narcos storyline that shows Pena having a relationship with Don Berna, the agent says he was fine with the drama: "We never crossed that line, but that's what makes the show exciting and interesting." The penultimate episode sees Escobar retreating to his father's farm. With the walls closing in and only his driver, Limon (Leynar Gomez), left alive, he knocks on the elder Escobar's door and enjoys an extended stay with his estranged parent. Newman has said the storyline was fictionalized (though Escobar did predecease his father, who was a farmer and estranged from the family) and Murphy says they weren't sure of his whereabouts at that point in the timeline. "Javier and I were manning the 1-800 number but people would call in with all kinds of tips because there was a $500 reward on the table," he says. "But we felt that he was still in Medellin or in the immediate area. That was home, where he felt comfortable and knew people. Everybody was willing to hide him. That’s where his stronghold was and given his situation, I can’t imagine he would leave that area." Pena adds of Escobar's final days: "He was running out of money and he was running out of time. We put a lot of pressure on and it was that relentless pressure that we later learned is what really got him killed." Newman also said little was known about Victoria "Tata" Escobar (Paulina Gaitan) at the time. Murphy says they didn't focus on her, but that her portrayal on the show was aligned with what they could piece together. "She was benefiting from all the illegal things her husband was doing," he says about Tata, who was 15 when she married 24-year-old Pablo. "She knew, just like his mother, what he was doing. But they had gotten comfortable in that lifestyle. They basically had anything that you could ever dream of. She took full advantage of her husband’s business, his station in life and certainly all the assets and benefits that having that much money brings. They had hundreds of people working at Hacienda Napoles. She lived like a queen." The finale shows Tata Escobar swallowing her pride and attempting to appeal to Gilberto (Damian Alcazar) for compassion when she asks her husband's enemy for help getting her family out of Colombia. On the series, Gilberto agrees, as long as she hands over all of her assets. Escobar's son, Juan Pablo, details the days after his father's death in his book, Pablo Escobar: My Father. Though Murphy says he has no respect for Juan Pablo ("He’s trying to save face for his family and create a better legacy than his father left behind"), he admits that his side of what the family had faced after Pablo's death was interesting. "We had always heard that Tata sent Juan Pablo to Cali to talk to the Rodriguez brothers and say, 'Hey, it’s over, we’re sorry, can we live here without fear?'" he says. "The Colombian national police told us that Cali told Juan Pablo: 'You guys got 24 hours and then you’re a target. You have 24 hours to leave Colombia.'" He continues, "In his book, he says they were trying to negotiate with the Rodriguez brothers, who were very upset by the war, and what they wanted was his assets. He talks about how Tata had to personally go negotiate these different surrendering of assets to all the Cali Cartel traffickers. He says they had to give up everything. I don’t believe what he says, so I don’t know if it’s true or not. But that was probably the most interesting thing of that book." Pablo Escobar died in a rooftop shootout in Medellin on Dec. 2, 1993. He was shot three times: in the leg, torso and fatally in his ear. Since that day, theories have proliferated as to who fired the fatal shot; Newman has shot down every single one, including Juan Pablo's claim that his father turned his gun on himself. Pena was called away for a daylong assignment, but Murphy was on the scene the day they caught Escobar. 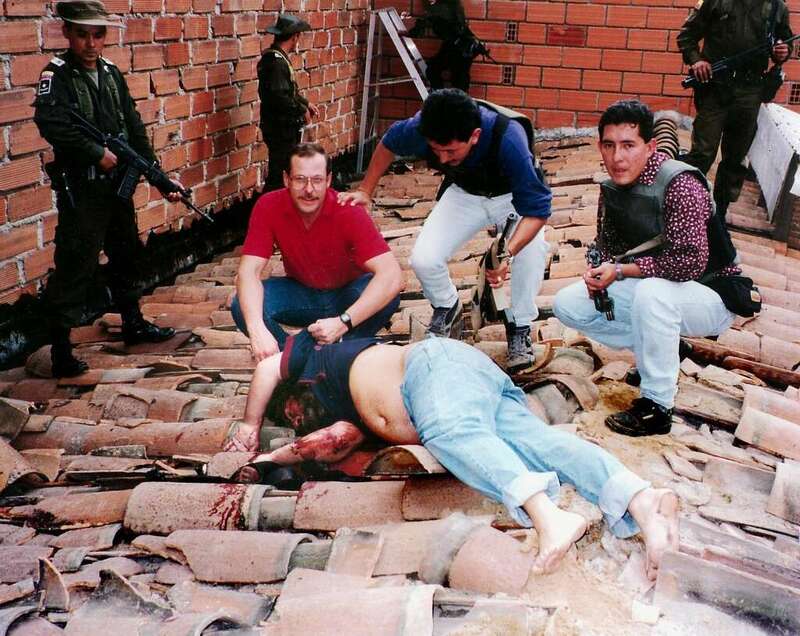 Though he wasn't on the rooftop until after Escobar was gunned down (a photo of Murphy posing with Escobar's corpse is easily searchable), he was the only one with a camera before the media arrived. Of Juan Pablo's theory that the shot was self-inflicted with Escobar's semiautomatic pistol, which was found next to his body, Murphy explains: "I saw Pablo up close and I have photographs of him. When a gun is held close to any part of your body and a bullet is fired, little pieces of gun powder come out. They only travel a short distance, a few feet, but it strikes the body and leaves what’s called powder burns. I saw the bullet hole in the side of Pablo’s head, I saw no signs whatsoever of the powder burns on his face. So that’s how I know he didn’t commit suicide." Murphy arrived on the scene with Colonel Hugo Martinez, head of the Search Bloc, and says the Colombian national police are the true heroes: "They were the guys that we worked with who would keep us alive and they’re the ones who told us what happened. We have no reason to disbelieve them." As for the photographs in which he and other members of the Colombian police are smiling while posing with Escobar's dead body, Murphy says, "The reason I was smiling is because we knew, effective that moment, every citizen in Colombia was safer simply because one man died." Pena calls it ironic that he wasn't in Medellin the day they caught Escobar, but says it doesn't matter because justice was served. "What matters is that he was killed," he says. "It was revenge for a person that killed thousands and thousands of innocent civilians and police officers, including a couple of my good friends." After news of Narcos' two-season renewal, Newman said the third season will focus on Escobar's successor, the Cali Cartel. On Oct. 12, with filming of the third season underway in Colombia, Netflix confirmed Pascal's return with a season-three photo. "The blow must go on. Pablo might be dead but the war is not over," the series tweeted from its official account. The streamer has yet to comment on the status of Holbrook's Murphy, however, and both Murphy and Pena couldn't comment on their future involvement with the series when speaking to THR. They did, however, confirm when they left Colombia: After vacationing with his wife, the Murphys moved back to the United States in June 1994. They adopted their second daughter in May before they returned. Pena left in October 1994. The season two finale set up a return for Pena, even though both of the real agents indicated they weren't involved in the real hunt for Cali. "The Medellin Cartel was the Wild Wild West and Cali was businesslike," explains Pena. "They were accountants, professional money-launderers. They were more sophisticated and very different cartels. Cali moved a lot of dope and sent more to the U.S."
It remains to be seen whether Newman will take liberty with both agents' timelines to also keep Holbrook onboard, but Murphy did have this to tease on a final note: "The agent who was there when the Cali Cartel was taken down, I think you’ll see him in season three." THR confirmed that two new DEA agents have been added as series regulars for season three: Michael Stahl-David (Show Me a Hero) as Chris Feistl and New Zealand actor Matt Whelan as his partner, Daniel Van Ness. Feistl is described as being the more serious of the two and a young agent who sought out assignment to Colombia as the drug trade shifts to Cali.